Dr. Will is known as one of the key influences in the development of a psychiatric guide which later became known as the Diagnostic and Statistical Manual of Mental Disorders. Dr. C.F. 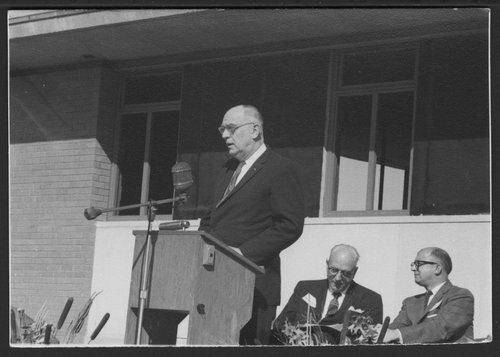 Menninger and his sons, Dr. Karl and Dr. Will, founded the Menninger Clinic for mental-health treatment, education, research, and prevention in Topeka. Dr. Bob, son of Dr. Karl, and Dr. Roy and Dr. Walt, sons of Dr. Will, continued in the leadership of the Clinic. The second image is Dr. Will on the right and Dr. Robert Switzer at an open house for the Children's Hospital in September 1961. In the third image, Dr. Karl (center) and Dr. Will (right) are being presented the 1961 Gold Medal from the National Institute of Social Sciences in New York in The fourth image shows Dr. Will with President John F. Kennedy in February, 1962. William C. Menninger, M.D. - Dr. Will at the dedication of a new building for the Children's Hospital. Government and Politics - Federal Government - Presidents - Kennedy, John F.